This figurine represents the English actor Sir Laurence Olivier (1907-1989) as Henry V, a part he played with great success on stage and film. It is one of a set of five figures issued by Briglin Pottery, makers of decorative domestic earthenware, in 1959, a year after they decided to revive the Staffordshire tradition of pottery figures of performers. The actor Herbert Lom, the partner of Briglin's founder Brigitte Goldsmith, contacted Sir Laurence Olivier, Vivien Leigh, Sir John Gielgud, Dame Margot Fonteyn, Paul Robeson, Maria Callas and Alec Guinness, who all agreed to feature. Lom wrote a leaflet advertising the proposed edition of 100 figures of seven personalities, which featured quotes from the subjects who all expressed delight at their inclusion. 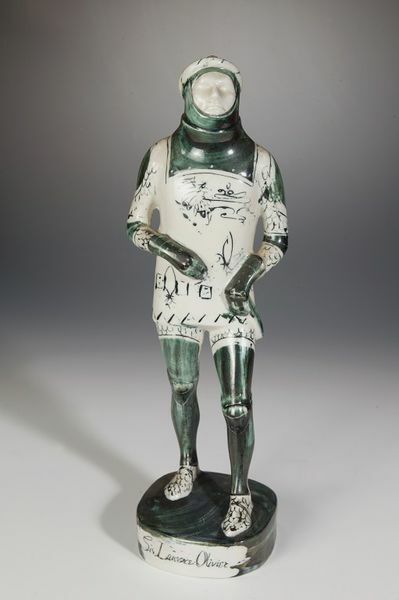 Since Briglin's earthenware proved unsuitable, Lom commissioned Richard Parkinson to design and make the figures at his pottery, using continental-type porcelain, fired at high temperatures and decorated in green and black. The slip-cast figures proved tricky; the moulds had to be made in several pieces and most of them, except Paul Robeson and Vivien Leigh, had to be tall and thin, very different in style to the rest of Parkinson's pottery. After Robeson, the fifth model, the Parkinsons realised their charge of £2 a figure was unrealistic. Since Lom refused to raise the price, the project was terminated and only about six figures of Robeson were made. In 1959, however, the set featured in London's Design Centre where Briglin sold them for 10 guineas each, and 40 guineas a set. The Duke of Edinburgh and Charlton Heston each bought a set. 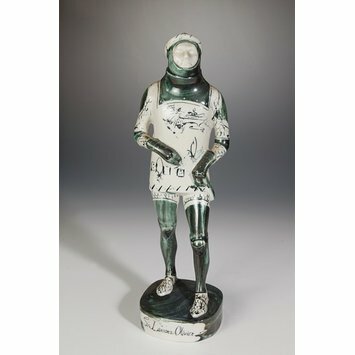 Figurine of Sir Laurence Olivier as Henry V in armour standing on an integral base inscribed on the front 'Sir Laurence Olivier' and on the back 'As Henry V'. Painted in green and black paint in detail to represent the chain mail of the leg armour, gauntlets and breast plate. In 1959 Briglin Pottery, makers of decorative domestic earthenware, decided to revive the Staffordshire tradition, almost extinct since the 19th century, of making pottery figures of outstanding theatrical personalities of the day. One of the founders of Briglin was Brigitte Goldsmith whose partner was the actor Herbert Lom; he made contact with the personalities that Briglin wanted to feature. These were Sir Laurence Olivier as Henry V, Vivien Leigh as Cleopatra, Sir John Gielgud as Hamlet, Dame Margot Fonteyn as Ondine, Paul Robeson as Othello, Maria Callas as Violetta and Alec Guinness as himself. Briglin planned a limited edition of one hundred figures of seven personalities. Lom wrote a publicity brochure, with quotes from the actors saying they were delighted to be included, and that the tradition was to be revived. Briglin Pottery used an earthenware body that was unsuitable for such detailed work so Lom, who lived near the Parkinsons in Kent, commissioned Richard and Susan Parkinsons to make the figures for £2 each. They were devised by Richard Parkinson, slip-cast from continental-type porcelain, fired at very high temperatures and decorated in green and black by Susan Parkinson. The figures were tricky to produce; the moulds had to be made in several pieces because of the detail, and because most of them, apart from Paul Robeson and Vivien Leigh, had to be relatively tall and thin, quite unlike the rest of the Parkinson's pottery. Vivien Leigh was the second to be made, and Susan Parkinson said it was difficult to produce a realistic model that looked well in a set with the others. In real life Paul Robeson was very tall and Viven Leigh very petite.